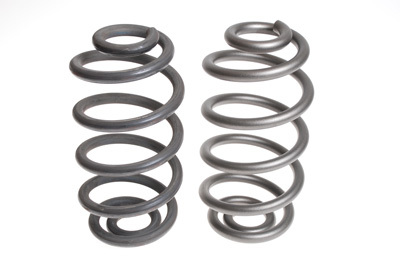 Every spring is manufactured from high quality spring steel. 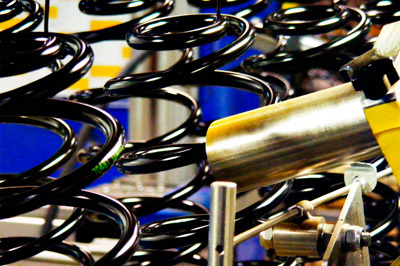 There are many steel mills around the world, but only a few are specialised enough to produce the high quality steel needed for modern suspension springs with high stress levels. Depending on the design, pre-heat treated (oil-quenched) or annealed (unquenched) wire is used. 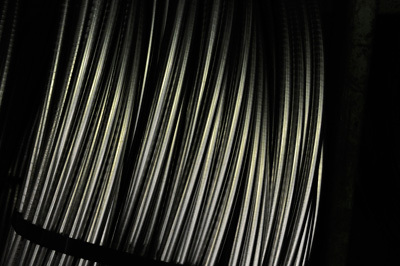 When pre-heat treated wire is used all springs are stress relieved directly in line after the coiling process. Springs manufactured from annealed wire are hardened and tempered after the coiling operation, to give the required high strength. In both cases the steel will have the same spring quality characteristics. 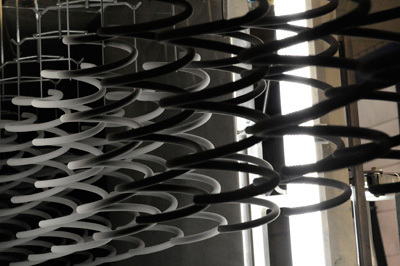 The wire is cold formed to spring shape in computer controlled automatic coiling machines. As opposed to hot coiling, which usually requires a specific mandrel tool for each design, cold coiling gives good flexibility, without mandrels, to easily vary the coil diameters, pitch and number of coils. 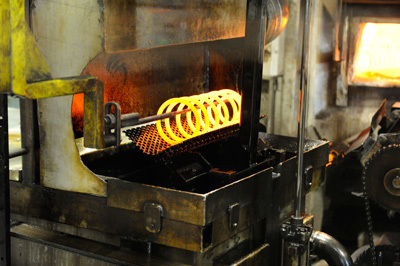 During cold coiling, negative internal stresses are introduced in to the spring material, and must be removed using a stress relieving heat treatment, following the hardening and tempering processes. After heat treatment, it is very important to introduce and control the level of positive residual stresses in the material. 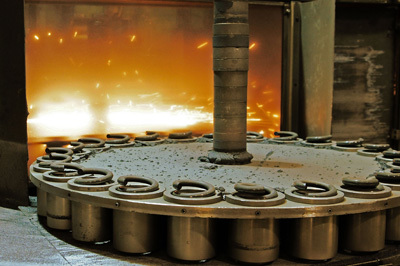 This is achieved via shot peening and presetting operations. The positive residual stress reduces the sheer stress in the spring during compression, raising spring performance to specified levels. Whilst introducing positive residual stresses, shot peening also prepares the spring material for the surface treatment processes of zinc phosphating and painting. The above photograph shows a spring before and after shot peening. 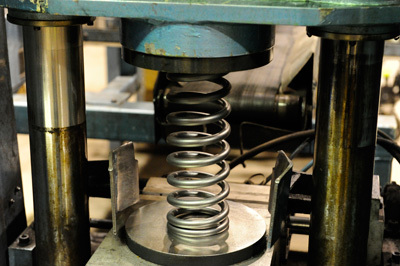 The presetting or scragging operation involves compressing the spring to implement a positive residual stress. Lesjöfors coil springs are protected from corrosion using the galvanic protection method of zinc phosphating before painting. This technique effectively protects the steel against corrosion even if defects occur in the paint layer. The spring is then painted using an epoxy powder coating process, before the production and batch numbers are applied via ink-jet printing to each spring. 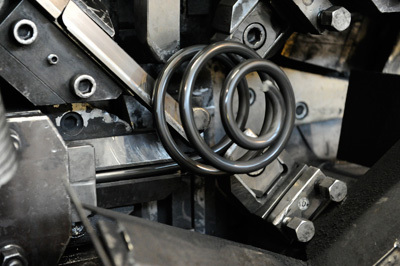 Please watch the below video to see the coil spring production process in action!